St. Hubert (d. 727), “Apostle of the Ardennes.” He was an active missionary in the great forest area of Ardenne. In 726, while fishing from a boat in the Meuse, he met with an accident that caused him much suffering, and he died fifteen months later. St. Hubert came to be regarded as patron saint of hunters and trappers in Ardenne; by the fifteenth century this led to the attribution of the legend shared by St. Eustace. This legend tells of the worldly St. Hubert coming across a stag with a crucifix between its horns, while hunting in the forest on Good Friday morning. The encounter had a profound impact and he sought the guidance of St. Lambert, the bishop, by whom he was converted to Christianity. 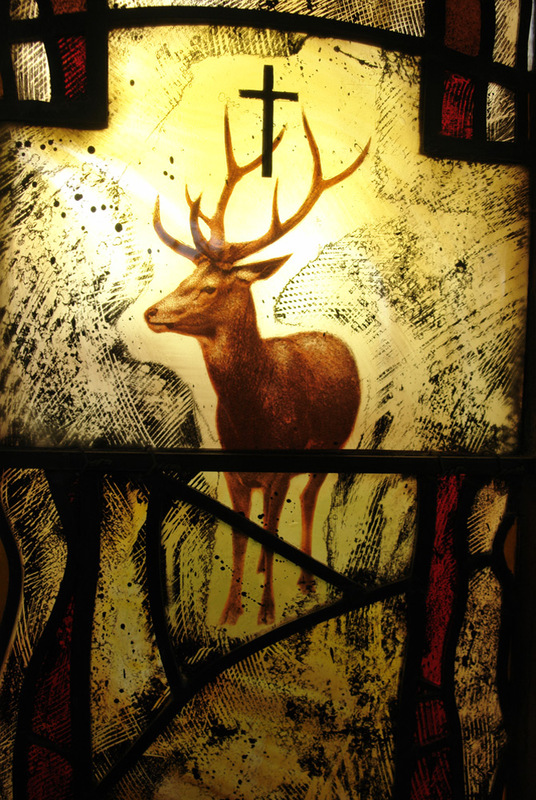 The stag is his emblem. Using the available information on St. Hubert, I was asked to create an original work that would be appropriate to the building and the theme of St. Hubert’s conversion. The work is an interwoven combination of symbolism and image, creating a modern semi-abstract design that reflects contemporary life, rather than a bygone era. 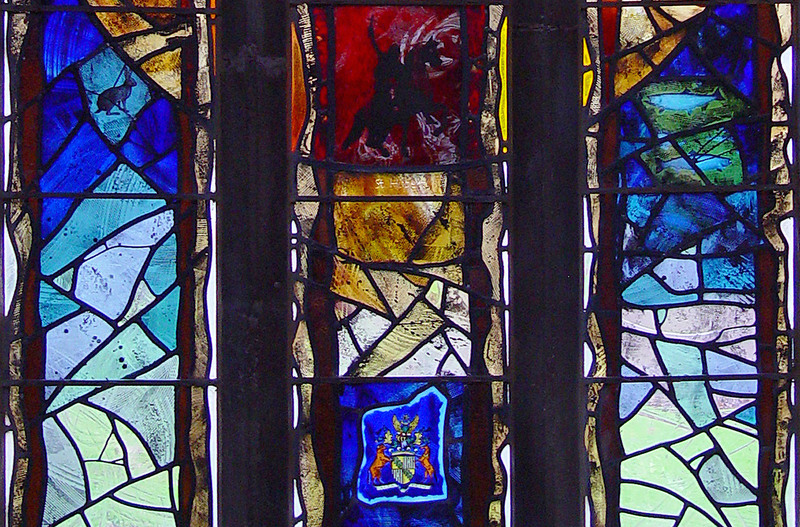 The theme of the window is a celebration of St. Hubert life and his dedication to Christ. 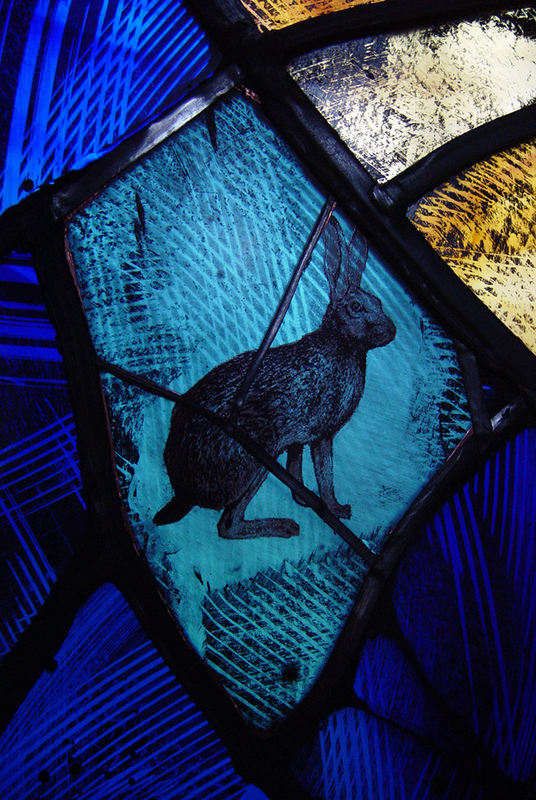 Many of the animals traditionally associated with hunting can be seen in the design. These images are partially hidden and the patient viewer is invited to discover these animals through careful examination of the window. 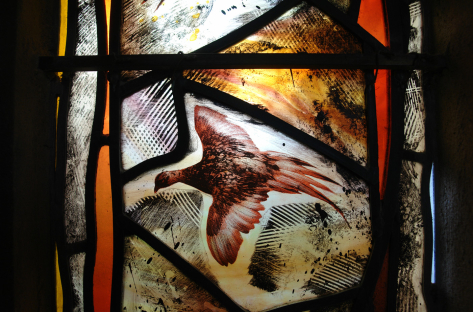 As in nature, the chance opportunity of seeing the flash of grouse feathers, or meeting the eye of a deer in the forest is reflected in the design. 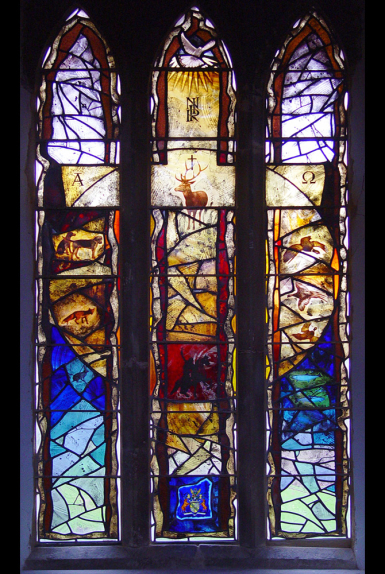 Clear and pale tinted antique glass in a random abstract pattern forms the background to a detailed arrangement of animals and Christian symbols illustrating the conversion of St. Hubert. 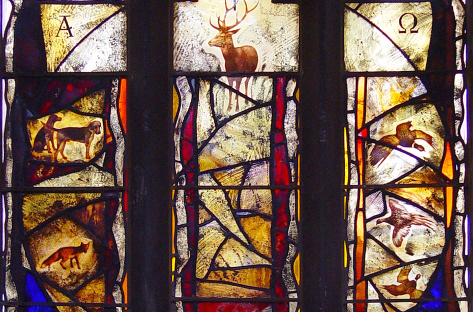 The focal point of the design is the central Cross, containing the Stag and the Crucified Christ. Above the Crucifixion are the letters “INRI”, and to the left and right “Alpha” and “Omega”; above the cross is a symbolic reference to the Holy Ghost in the form of a dove. 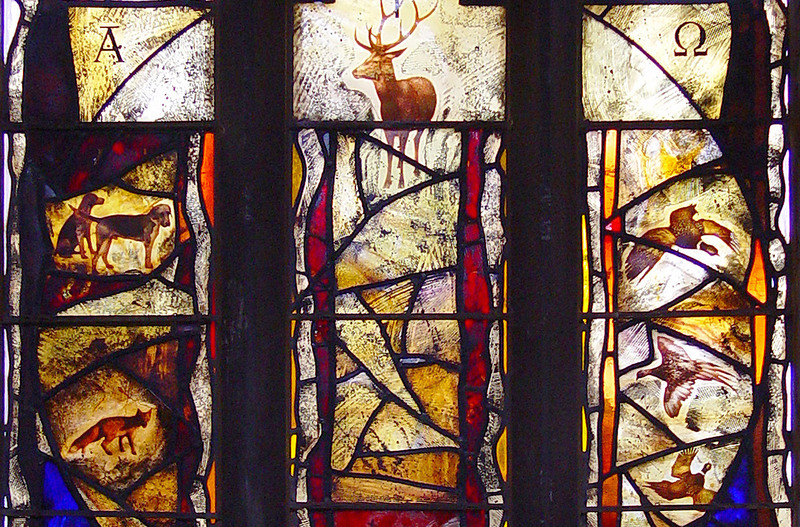 Below the stag sits the image of St. Hubert astride his horse, holding a crucifix in his right hand. At the bottom of the central lancet is the family crest of the donor. Surrounding the central cross are many of the animals traditionally associated with hunting, shooting and fishing, including grouse, deer, salmon, trout, a fox and hunting hounds. 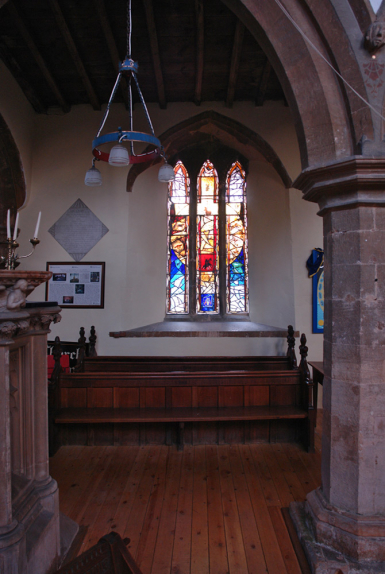 The colour scheme of the window is based on the prevailing colours of existing stained glass within the church, namely yellows, reds and rich blues. Clear and pale tinted glass is used in the background to maintain light levels within the church. 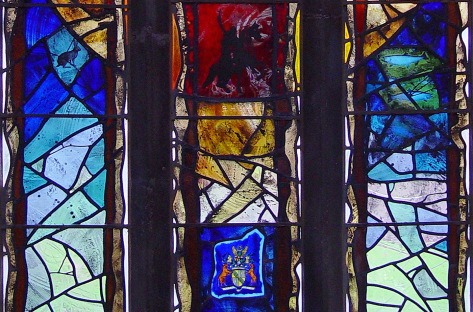 The window is to be made using traditional techniques and materials. 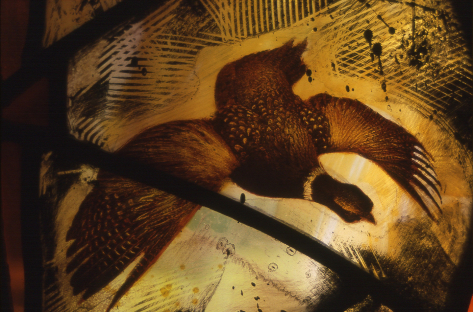 The working method uses flashed antique glass with multiple areas of etching and painting. The images are applied to the glass in a combination of hand painting and screen printing, using black vitreous paints and silver stains, which are fired in a kiln. The panels are leaded together with traditional lead came, soldered and cemented. The windows are installed directly into the stonework with lime putty to match colour of surrounding masonry. The supporting bars are fabricated in manganese bronze 9mm square section.